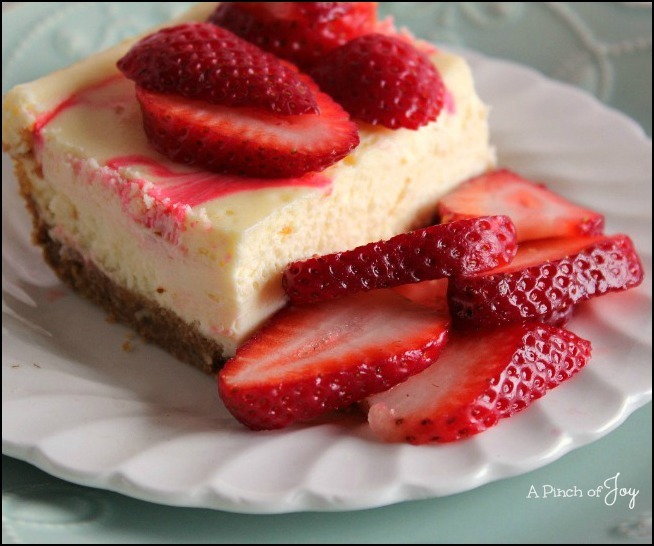 This Strawberry Swirl Cheesecake is the BEST cheesecake recipe ever baked. The toasted pecan crust has just the right flavor to set it apart from the run of the mill crust. The cheesecake is divinely creamy, so very rich and smooth. Make it plain without swirls and it is deliciously decadent. Add the subtle flavor of strawberries for the essence of spring amidst the decadance. Add beautiful deep pink swirls and you have a feast for the eyes – which makes the cheesecake taste even more wonderful. The swirl is harder than one would think. At least it was for me. Using a smaller than teaspoon – a toddlers narrow spoon – worked best. Drop the colored and flavored mixture in a row a couple of inches apart. Then work the color into the cheesecake itself by inserting the spoon in the middle of each spoonful and thrusting it up and down a few times. A toothpick is too small to make the swirls, a skewer or thin narrow knife blade (tomato slicing knife) was just right. Serve with sliced and sugared strawberries, if you like. I’ve been looking for a good cheesecake go-to recipe for a long time. And found two. I’m sharing the goodness! You’re welcome!! This is the BEST cheesecake recipe ever baked -- creamy, rich and deliciously decadent! Place graham cracker crumbs in bottom of 8x10 baking dish or 10 inch round cheesecake pan. Mix in sugar and chopped pecans. Melt butter in microwave, approximately 30 seconds. Pour over crumb mixture and stir well so that butter is thoroughly distributed. Use a heavy glass to press mixture firmly into baking dish. Bake for 10 minutes at 350. Remove from oven and set aside to cool. Turn oven down to 325 degrees. Beat cream cheese, sugar, vanilla and cornstarch until fluffy. Add eggs and heavy cream, mix well. Remove ¾ cup of mixture and set aside to make strawberry swirl. Pour remainder evenly into cooled crust. Mix strawberry jam into reserved cheesecake mixture. Add food coloring to desired shade. 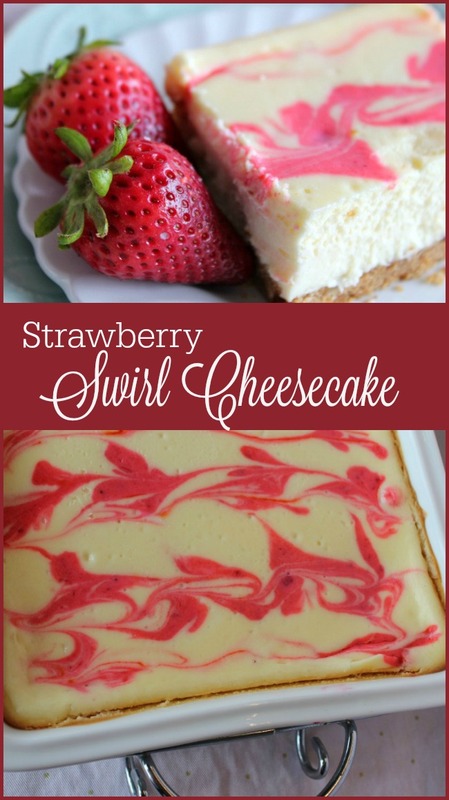 Drop strawberry swirl by small spoonsful in an even grid over cheesecake. Use a thrusting movement up and down to work the dropped swirl mixture into the cheesecake itself. When completed, insert a small knife blade or something similar in the center of each dot of swirl mixture and gently create swirls. Bake at 325 for 35 minutes until edges are just golden brown. Knife inserted in middle will come out clean when cheesecake is done. Cool and refrigerate until ready to serve, at least two hours or overnight is best. Serve with fresh sliced strawberries, if desired. This looks spectacular and with pecans in the crust…oh MY!!! !